"This is a homecoming of sorts for me in that I raced for both King Taco and Performance Motorsports in 2003 and had a great year finishing 3rd in overall points and winning the big one at California Speedway," said Steve. I feel with the additions that we have made to the team and the commitment by King Taco, this will ensure that we will be of championship caliber," he added. 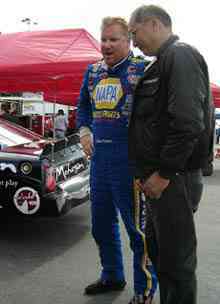 Steve Portenga is a veteran of the NASCAR Grand National West Series having first competed in 1999. His resume includes 67 starts, 7 wins, 25 top fives and 48 top tens. He finished the 1999 season in 3rd, followed that up in 2003 with another 3rd place finish and this past year finished 2nd in the runner-up position winning races at Pikes Peak Raceway, Thunderhill Raceway and Irwindale Speedway. Steve is also a 2 time Southwest Tour champion, winning the series crown in 1994 and 1998. King Taco Racing is no newcomer to the series having their name on Grand National West cars for over 6 years. King Taco Racing also has a large presence in the karting, Legends and open wheel divisions.
" We are excited to have Steve come back to us full time and we know that he is of championship quality," said Raul Martinez of King Taco Restaurants. "He has shown us in the past his burning desire to win races and we know that teaming up with Performance Motorsports is the right move at the right time for our racing program." King Taco Restaurants is a family owned business with locations throughout Southern California. Those locations include The Long Beach Grand Prix, The California Speedway and The Irwindale Speedway. Their motto is "Exquisitamente, a la Mexicana"
The King Taco car ran the #7 at the NASCAR All-Star Challenge, but will be #77 next year. Performance Motorsports has been on the NASCAR scene for over 25 years. Their list of past drivers is a who's who of NASCAR racers. Performance Motorsports supports NASCAR's drive for diversity and is proud of it's Hispanic ownership, one of the very first in NASCAR. The NASCAR Grand National West Series will hold it's series banquet at the Orleans Casino in Las Vegas, Nevada on Saturday December 10, 2005. The first scheduled event for the 2006 season will be at Phoenix International Raceway on January 21 through the 22nd. King Taco Racing announced today that they have signed a 2006 racing contract with Steve Portenga and Performance Motorsports. Steve will drive the King Taco Racing # 77 Ford Taurus for the 2006 NASCAR Grand National West season.